the overall quality is a good as it should be in this price range. I am particularly impressed with the construction of the wrist rests. Now this is the first time I have tried any Matias switch and I must say I'm suprised at how different it feels to Alps SKCM. I can't say much more yet, hasen't been long enough.Layout wise it's the best damn bottom row ever, once you've gotten used to it that is! Makes me want to try JIS. The Ergo Pro is an impressive keyboard, that's for sure. Would I buy it? I have no idea yet. Yeah, its different all right. Got a lot of personality. How are you mapping the right Command key: as Alt Gr? Muirium wrote: ↑ How are you mapping the right Command key: as Alt Gr? Not at all so far! The gigantic control key is brilliant and deadly, it's like a big shift killer. FN is right where it makes sense. I'll just have to keep this a month to get used to the layout OK? I'm sure everyone is fine with that right? Going well thank you. I can summarize the Ergo Pro is nice but not for me. I also got enough pictures out of it for an album. I am ready to send it to Ascaii, if he's not up for for it now wlhlm is next in line. I'll PM Ascaii now. Update: the Ergo Pro is with Shreebles. I've bumped Ascaii down the list, so hopefully he's not as busy when his turn comes up. Yes, the keyboard arrived here with no issues. I didn't have much time previously due to exams, but I will at least have the opportunity to test it for a few days. I am typing on it right now and in one word, I would call it refreshing. It looks quite odd, but the moment you put your hands on the large, soft pads it feels very natural. The keys themselves are a mixed bag. On the one hand, they are nicely tactile. Very close to Ergo-Clear actually. The keyfeel itself is mostly good, but slightly rough and a bit bumpy, less bouncy or springy than ergos. All while feeling a bit more like a high-quality rubber dome. Not a bad thing really, since you get good tactile feedback with soft bottom out and the very high reliability and durability of a mechanical switch. They are not quieter than my Ergo-Clear keyboards overall. This might be due to the keycaps. No discussion here, these are definitely holding the potential of this board back. High-pitch clattering and clacking is something that I would remedy with thicker keycaps on a Cherry keyboard. With this keyboard, no dice. The downstroke is a bit muted, but in my opinion the only keys that sound really nice are the two spacebars. The whole board pings quite badly. The look and feel is also a mixed bag. It looks weird, but feels quite good to use. The two halves are quite heavy! BUT the quality of the plastic could be better, maybe with a rough texture? The keycaps really need better and thicker plastic as well, for a keyboard that would cost me 300€ to import. And a different printing method than lasered infills. Those are terrible. The layout is mostly good. It shows me that I cannot do proper touch typing 100%. For instance, I tend to press 'b' with my right index finger. On this board, this is a recipe for disaster with the stupid numlock!! I am also used to pressing F5 with my right index finger, but 'h' with my left. Doesn't work so well on the Ergo Pro. I could push the two halves together to be able to use those keys with either hand but that would be taking away the biggest advantage of this keyboard. Half-height keys are interesting but I'm not sure I support them 100%. Half-height function keys are unnecessary as there would have been room for full-height on this board. On the left cluster they make more sense in order to fit more keys there but no one needs those anyway when you have keyboard shortcuts like CTRL+C and CTRL+V always in reach while typing. Small arrows are annoying, but I like the big spacebars to make up for their reduced width. The fn key is too far away to be much use to anyone. The navigation cluster is heresy!! And the large CTRL key is downright comical. Tenting and tilting are cool additions, but I feel that the feet are too long so the whole assembly becomes a bit too high for my comfort. Then again, I'm not very tall, someone else might benefit from this. Personally I would probably mod it somehow for negative incline at a smaller angle. While the keyboard has a compact layout, it is not any more compact than most full-size keyboards if you have the halves at least a few cm apart and angled, as you should. This moves the mouse further to the right. Unless you have a good trackball in the middle, your typing will improve while your mousing will be made worse. This really needs a mouse control function. My RS84 has this through its controller and it is a nice addition if you don't want to take your hands off the keyboard when making small corrections with the mouse. Well, they definitely made some weird decisions, but a convincing product overall. I hear they also got rid of the annoying numlock, though we could maybe fix this ourselves with our own drivers. Since it is a hardware function, I have been unable to change it through the windows registry, unfortunately. Testing this keyboard is quite fun (and, as I said, refreshing, especially for someone who has not tried an ergonomical keyboard before), but it has not convinced me to buy an Ergo-Pro, let alone any Matias keyboard. For the price, I expect higher quality keycaps and plastics, as I could almost get a Realforce this kind of money. The switches are not bad and definitely usable any day of the week, but not as refined, smooth or quiet as I had hoped. I'd say they are at least as good as Ergo-Clears, while slightly heavier, but lack their keycap compatibility. The option of half-height keycaps are not enough of an advantage to make up for this. I work in IT, and if I had any issues whatsoever with RSI or wrist pain I would buy the Ergo Pro in an instant. Hell, I might even get some of the money back from my employer, since they are obligated to allow us to work while avoiding injuries, and I need a proper keyboard to work with computers properly. But since I don't have any wrist issues with regular keyboards I will stick to Cherry and IBM for the moment. Either way, I enjoy being a part of this tour and happy and thankful to be able to try an ergonomic mechanical keyboard for the first time in my life. Thanks, Muirium! I will keep testing the board for a few more days before I pack her up again to send it to the next one in line. - I just found out that the keyboard can be bought directly in Germany for roughly 220€. 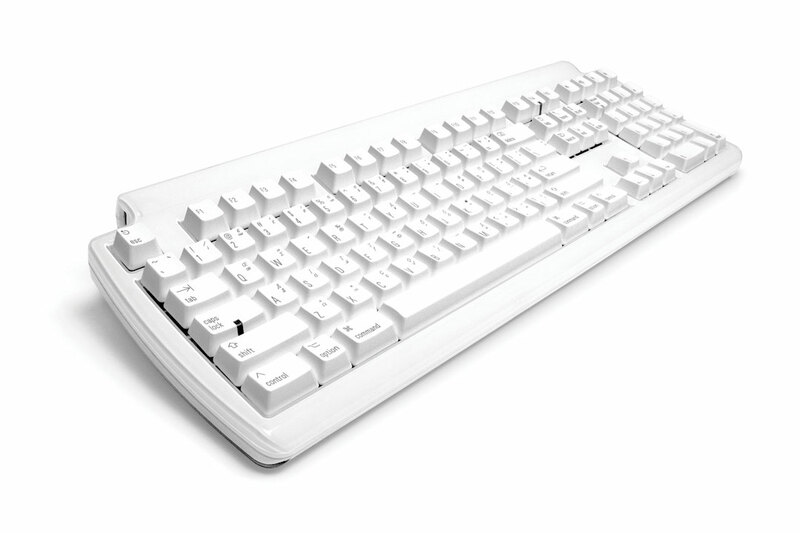 This makes it a much more viable option compared to a Realforce, or other ergonomic mechanicals. - That said, I would still refuse to shell out 220€ out of my own pocket for a keyboard that isn't perfect out of the box and has no options for better keycaps with more durable legends with better readability. 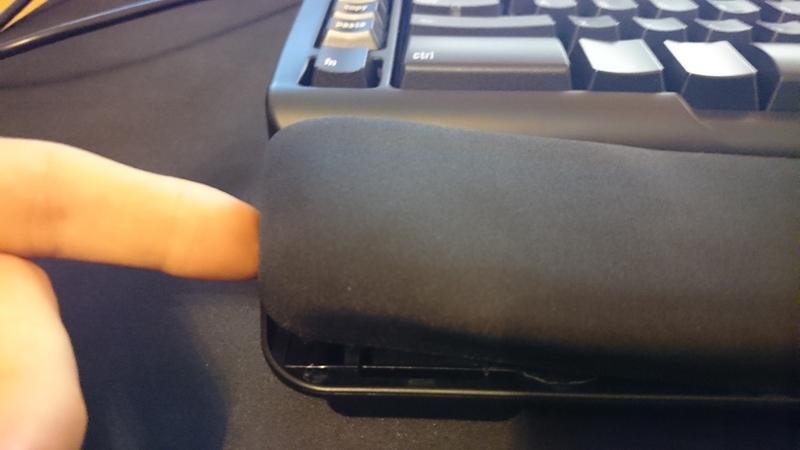 - The glue is coming off on the wrist pad on the left keyboard half and the pad is almost coming off... Mu are you aware of this?? Last edited by shreebles on 25 Nov 2015, 18:35, edited 1 time in total. Muirium wrote: ↑ "Look, I've no idea what's going on, but I've got people here without keyboards. There's none left. Yeah, that's what I'm saying. Zero. Everyone's just sitting here, waiting on hardware. How are they meant to work? Right, sure, I'm on it. I'm going to get some heavy stuff no one can walk out with so easy this time. Yeah, real old looking! No one wants that. Perfect! You got it." Puts down phone. Grins widely at empty office. Starts putting out the Apple keyboard trash. I know this is an old post but i only just seen it. But the sad truth is, even half the people who understand the BOFH don't understand us. The only this that I did not like about the "wobble" on the Matias switch. Much more present than on Alps SKCL/SKCM. Good write up shreebles! Same here, for €220 I would get something else. But it is a good keyboard and a high quality product no question. shreebles wrote: ↑ The glue is coming off on the wrist pad on the left keyboard half and the pad is almost coming off... Mu are you aware of this?? News to me. Can you take some pictures and post them here? I did not notice that. Strange. The whole pad is off? Hard to believe. As for the overall Matias experience, I agree they come at keyboard layout and design choices from a strange angle. Matias used to be all about Mac keyboards. 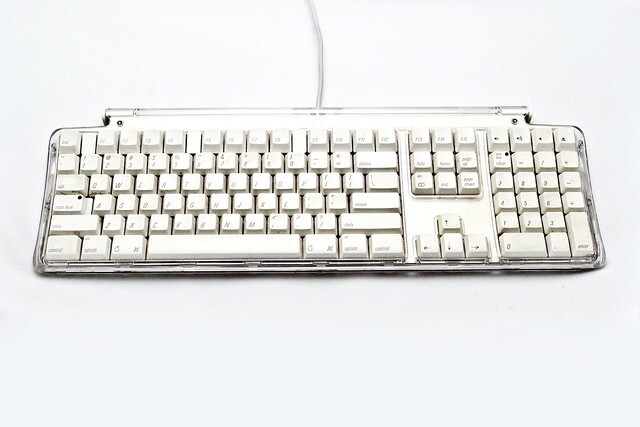 Back in the 2000s, Apple's boards looked pretty when just out the wrapper, but turned ugly fast, and were mushtastic. Matias carved out a market as the go-to guys for a mechanical upgrade. I heard about them years before Filco or Topre. They were doing very well on the Mac. Matias made sure his keyboards looked familiar by adopting as many of Apple's layout choices and design cues as possible. Things like unnecessary half-height function rows and that strange curvy chassis you can still see on the Tactile Pro. Since Apple went to flat metal bodied chiclet keyboards in 2007 or so, Matias has branched out into PC and now Ergo keyboards, while (very slowly!) moving away from the dated early 2000s Apple design style. It's still in their DNA, though. So a lot of the oddity of the Ergo Pro is the legacy of seeming as familiar as possible to people with iMacs, many years ago! seebart wrote: ↑ I did not notice that. Strange. The whole pad is off? Hard to believe. Hard to believe and I didn't mean that the whole pad is off! I said it's starting to come off. It still holds in place, it can just be lifted very easily. Made a picture to make it clearer. The glue is gone on the left side of the left hand pad. On the right hand side, it still holds which is why the pad isn't coming off (yet). On the right half, it's fine. Disappointing. How about the other pad on the right side? shreebles wrote: ↑ On the right half, it's fine. There was a very small amount of movement on the left pad when i had it but nowhere near as bad as that, i would say 2-3mm at the very corner, i did not even think it work mentioning as it could have just been a small amount of missing glue form production. andrewjoy wrote: ↑ [...]could have just been a small amount of missing glue form production. It could well be that. It's fine when you leave it alone. I just mention it now because it could become worse in the near future. Some good strong double sided should do it for the rest of the tour. To do it properly some impact adhesive, the evo stick spray one should do just fine , and better yet as it only sticks to itself if you get it on the outside of the pad you can just rub it off. Wonderful stuff, i just laid the carpet tiles in my office with it , its better than the stuff in the tin or the tube as it provides a nice thin coat , just what you need. I'm still shocked (at myself) that I did not notice this at all, oh well. You can do that here without having to be hired! But I have a question about the pad, when you rest your hand on the pad do you notice it's loose without looking at it? seebart wrote: ↑ You can do that here without having to be hired! To be honest you are right though, these tours are pretty great. This is the third one of this kind that I participated in and so far everything has gone really well every time. Great opportunity to test keyboards that you cannot afford. seebart wrote: ↑ But I have a question about the pad, when you rest your hand on the pad do you notice it's loose without looking at it? In other news, the keyboard was successfully delivered to the next person in line, wlhlm. See that's what I thought, because it did not feel loose either in which case I would have had a look myself. Sorry guys, I was away for a while, but I am back now. You fancy taking your turn right about… now? It's time! I'll PM wlhlm and get things moving. It's either you or Cookie! I received the keyboard about an hour ago. wlhlm wrote that he could only send it in the new year, i guess it took a bit longer. There's a dip switch under one of the control keys that lets you set one of the spacebar keys as backspace (amongst other things) which is super handy. edit - Nice to see you back again btw .